Just the thought of an African safari can cause most parents to run for the hills. It’s true; luxury lodges can run hundreds of dollars a day per person. But, while living in South Africa, I learned that there are great safari options in Africa that won’t break the bank—especially if you are camping. 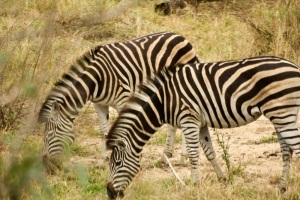 The Kruger National Park in South Africa is surprisingly affordable. Locals know that the best way to see the Kruger is by self-driving. Fly into Johannesburg, rent a car and road-trip to Kruger National Park. Lodges and campsites within the park are surprisingly affordable. No need for 4x4 here, the majority of the roads within the park are paved and easily accessible by car. Your kids will love the opportunity to spot animals from the safety of your car as you roam through the African bush. The campsites in the Kruger National Park are kept up and would rival many campsites in National Parks throughout America. Your family won’t be disappointed by the variety of animals in the Namibian savannah conservation area. Etosha National Park is home to the Big Five: elephant, rhino, buffalo, lion and leopard. This is also a great place to see the endangered black rhino. Like the Kruger National Park in South Africa, Etosha National Park is unique in that it is fully accessible by 2x4 vehicles. Most people visiting will rent a car and drive the 270 miles from Windhoek. You’ll find great campsites outside park gates—the majority will have hot water and electricity. Many even having swimming pools so you can cool off after a warm Namibia day. When the Serengeti crosses into Kenya, it becomes the Maasai Mara. As the less popular park, the Maasai Mara is a cheaper option than the Serengeti. But don’t let the price fool you, the smaller, lesser-known park boasts many of the unique features of the Serengeti. The Maasai Mara is a wonderful place to visit the remarkable wildebeest migration. A million Wildebeest travel from the Serengeti into the Maasai Mara each year. Joined by hundreds of thousands of zebra and Thompson’s gazelle, the wildebeest travel in groups 25 miles wide through crocodile infested waters for fresh grazing. Camping safaris cater to all members of your family—including your kids. Chobe National Park in Botswana is known for it’s large hears of elephants. It is also just a stone’s throw from Victoria Falls, making it a great way to explore African wildlife and see the magnificent falls. Interested in getting a few more passport stamps? A visit to Chobe National Park could easily be combined with a trip into Zambia, Zimbabwe or, for the more adventurous, Angola. There are great campsites in the National Park. You can also camp outside of the park and drive in for the day. Zimbabwe hasn’t always had the greatest reputation for travelers, but over the past few years the economy has stabilized and it’s becoming a popular travel destination once again. A visit to Hwange National Park won’t disappoint. I suggest taking a break from camping at Hwange National Park. Your kids will love staying in a luxury tree house at this national park! But be sure to keep them from wandering around at night; hyenas, elephants and even buffalo are often seen wandering around the lodge after dark. A true African safari doesn’t have to cost a fortune—especially if you camp!